I like to think I have quite the detective mindset (what woman doesn't?!) and would always know when I was going to be proposed to. Christopher would act nervous or different that day or even week, we would have a lot of friends and family with us, he would probably do it on stage somehow and somewhere because he used to be in a band and loves hosting events, and others who knew beforehand would drop hints without realizing it - that's what I thought would happen. Funny enough, that's EXACTLY what happened...and I was completely clueless! As I said in Part 1, Christopher WAS extra nervous that week, so many of our friends and family were in attendance (even some of the ones who always bartend on Friday nights), and when I look back I realize that others actually did drop hints with out realizing it. What I haven't told you yet is how he actually did bring me on stage and propose! When Christopher hosts events like the one he did on this particular night, I'm totally his groupie who stands right smack dab in the middle at the very front of the crowd. I love supporting him & watching him in his comfort zone, sometimes videoing, and being close enough to have his back with anything he may need. So per usual, when Christopher got on stage to announce the main act of the night (Trippin Roots), I was front and center with my video turned on! Before he officially introduced them, he read off a list of people in the audience who had won free Trippin Roots swag - shirts, albums etc. Then he got to the "end" of his list and called out my name as a winner - "Ashley Zander, my actual effing girlfriend!" He reached for my hand as he told me to come on stage...and me being a few bourbons in (didn't know I was supposed to pace myself & no one could really tell me I had a reason to) told him I was not getting on stage...as I grabbed his hand and excitedly went up anyways! Christopher had me walk over to band member, Evan, for my free prize. Of course, my klutzy self being in wedges and a few bourbons in, almost tripped over a cord on stage in the process! Haha! As I had my back turned, our friend Larry tossed the ring up on stage to Christopher who then asked Evan if they were out of gifts. Evan told me he didn’t have any gifts for me. Christopher then followed with, "Ooooh, guys we're out of gifts," and "hey baby, I think you might like this a little bit more...honey, I love you, will you marry me?" CUE THE TEARS! But no really. I was in complete shock - forgot how to walk, forgot how to talk, couldn't do anything except hold my hand over my mouth and cry happy tears! Evan literally had to push me towards Christopher! Haha! As I finally reached for his hand for him to stand up, I managed to nod my head yes. You guys, I've literally watched hundreds of proposal videos and even some in person over the years. I've seen the girls who don't say "yes" immediately and the guy just stays on his knee awkwardly for a minute or two. I always told myself, "when it happens, I'll make sure the first thing I do is say 'yes' so he can stand up and then I'll react." NOPE! Not how it happens! Not. At. All. There's really no reason to even try to prepare for how you'll react because it just won't end up that way. Pointless thinking. So anyways, I cried. A lot. Did I mention I had been drinking bourbon? Yeah? Well the bourbon wouldn't let me stop. After Christopher put the ring on my finger, we danced on stage to Trippin Roots playing a song that Evan wrote when he married his wife, and then we made our way to the front deck of The Burl. (Shout out to my little brother and my uncle who built their deck!) My sweet mom kept trying to bring me water as I would sip it and scream, "I'm so happy, I just need more bourbon,” or “I’m being punked,” and although I was being a big happy crybaby, she and my dad stayed by my side, sharing in my excitement. All in all, the night was a success! 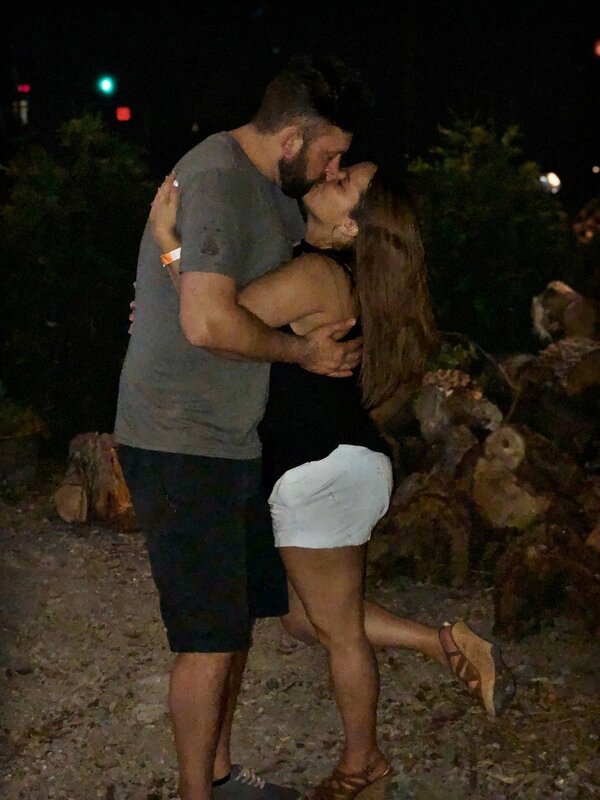 Christopher pulled off the most amazing proposal without me having the slightest idea, I said "YES," we gained the new titles of fiancé and fiancée, we celebrated with family and friends, and then we ended the night with Taco Bell! ;) I couldn’t have asked for anything more. If you’re engaged or married, share your proposal story in the comments! If you’re not, share your dream proposal!